(BPT) – Vacation may be a time to relax, but things can take a serious downturn if you lose your passport or if there is disastrous weather at your destination – or worse, you need an emergency medical evacuation. Though travel insurance can seem like just one more expense, without it, an emergency evacuation can cost over $100,000! Tip: To compare quotes and make more sense of them, divide the quote by the number of days you’ll be traveling to get the cost of coverage per day. * Trip cancellation or interruption: With trip interruption coverage, you’ll have the money to refund the expenses of a new return ticket or to stay in a comfortable hotel. * Emergency illness or injury: With travel medical coverage, you won’t be paying a huge medical bill. You’ll also have assistance services – in your own language – to locate a suitable medical facility and arrange transportation. * Baggage delay, loss or theft: With coverage for delayed bags, you can relax. You’ll also be reimbursed for the essential items you need to start enjoying your trip. * Bankruptcy of travel supplier: You’ll be able to recoup your expenses and reschedule your vacation. * Weather-related delay: With protection against weather damage, you’ll be able to recover your pre-paid costs while travel assistance services will help you arrange a vacation to a new location. With these coverage options, it is important to be upfront about pre-existing conditions and read the fine print to understand what you’re paying for. Remember: Don’t pick one just because it’s cheap; make sure you understand your needs and purchase one that makes sense. 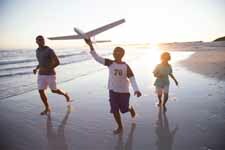 While people understand the importance of travel insurance, they don’t often understand how it works. It’s really quite easy and no different than auto or home insurance. If an incident occurs, just contact your travel protection provider and start a claim to receive reimbursement and assistance. At the end of the day, a vacation is about spending time with loved ones, unwinding from the daily routine and making happy memories. It’s not about worrying endlessly about all the things that could go wrong. Therefore, when it comes to protecting ourselves and our precious belongings, we shouldn’t think twice about travel insurance – it’s a must. For more information on travel insurance coverage and to request a quote, visit USAA Travel or Travel Insured International.